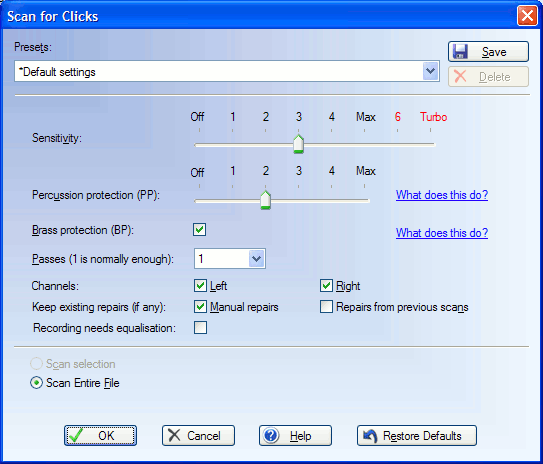 VinylStudio has a fast and flexible declicker which is very effective at removing clicks and pops from vinyl recordings. You can scan an entire LP side or just part of it (perhaps with different settings) and most clicks can be removed automatically in this way with no manual intervention required. Fortunately, severe clicks like this are usually easy to spot in the waveform display so fixing them manually is npt too difficult, even if VinylStudio has missed them completely (although this is rare). Sharp percussion sounds or a blast from a brass or reed instrument can fool programs that scan for clicks (they think it's a click and modify the audio as a result). All declicking programs suffer from this problem in varying degrees, and the result is that drumbeats, handclaps and other percussion can be dulled, and brass, sax, synth and other such 'rasping' sounds can be distorted, sometimes badly so. To combat these problems we have developed proprietary solutions, called Percussion Protection and Brass Protection respectively, which allow you to declick your valuable recordings without damaging them. These are powerful tools for distinguishing music from clicks. For more information, follow the links. These will take you into the VinylStudio help file. If you would like to hear some sound samples, please click here.